This is a hard book for me to review. I just finished it for the fourth time, and I really cannot tell you what it's about. 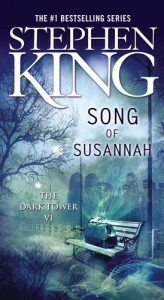 Unlike every other novel in the Dark Tower saga, Song of Susannah doesn't stand on its own. It's a continuation of Wolves of the Calla, and by the story's end no plot threads are finished — everything is left hanging for the finale. It's a fast-paced tale, and the writing itself is good, but it simply doesn't stand on its own merit. The problem is nothing really happens here. There is no major character development. The reader is not introduced to any new concepts or ideas or characters. It just feels incomplete, or like King wrote the book on autopilot. There is a reason it took me over a week to finish what should've been the quickest read in the DT cycle — this book is a bit of a chore. That being said, this book is not bad. The Ka-tet is as lovable and fun to read about as ever, but I do not like the fact that they are split up throughout the entirety of this novel and don't come together until book seven. King expands on the meta concepts introduced in Wolves of the Calla in interesting ways, though the developments can be a bit much to handle. I personally love King's insertion of himself here — I think it's the most thrilling part of this particular book — but I know some fans are repelled by it. That's cool. Different strokes, and all that. I'm keeping this review short because, honestly, I'm struggling with finding things to say about Song of Susannah. It's not bad, but it's not great. It's an easy read, but it does nothing but set the stage for The Dark Tower. It has identity issues, and it's a little messy. I was going to give it three stars, but I'll be generous and give it three and a half. I think it works as the penultimate story in this series, but I certainly don't love it.